The Whiskey Painters of America (WPA) have been invited to participate in the 36th Whiskey Painters of America Exhibition and Art Sale held at the Cuyahoga Valley Art Center, 2131 Front Street Cuyahoga Falls, OH 44221, from April 24th – May 24th. This popular annual exhibition opens on Tuesday April 24th , kicking off the People’s Choice selection process. We invite the public to participate in our People’s Choice voting process that will select the top ten best’s of show paintings on display. This voting will conclude during the public reception to be held on Friday, May 11th from 4:30-7:30 PM in the main gallery. This exhibition will display the largest collection of Whiskey Paintings for sale in one location in the world. A Whiskey Painting is a watercolor miniature, no larger than 4” x 5” in size, and is created by dipping one’s paint brush in some form of alcoholic spirits instead of water. The WPA was officially established in 1962, at Tangier Night Club in Akron, Ohio to promote the fine art of painting in miniature. To become a member of this exclusive organization, an applicant must first have a bona-fide member of the WPA as a sponsor. The Whiskey Painters of America is the most unique and exclusive miniature painting society in the world. 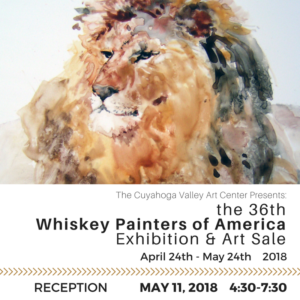 For this 36th exhibition, members of the WPA have elected to donate Whiskey Paintings to be raffled off at their reception to be held on May 11th from 4:30-7:30 in the gallery at the Cuyahoga Valley Art Center (CVAC). The proceeds from these raffled items will be used to support the art departments of our local elementary schools. These schools are doing their best to function with a yearly budget equal to less than the price of two Whiskey Paintings! Thus, every dollar goes a long way in support of the arts for these art students. Monetary donations towards this cause will be accepted at the reception as well. Raffle tickets can be purchased after April 24th at CVAC or over the phone at (330)928-8092, 1 ticket for $10 and 3 tickets for $20. Buy-it-now prices are also available for some of these donated items. Whiskey Paintings, the perfect décor for your home or office, generally sell for a minimum of $75 to as high as $1500, with the average selling price between $150 and $300. Thus, by purchasing a raffle ticket you have the potential to win a Whiskey Painting for as low as $10, while donating to a worthy cause. To donate towards our local elementary art departments and potentially take home a Whiskey Painting purchase your raffle ticket today! Winners will be selected at the 36th Annual National Whiskey Painters of America Exhibition and Art Sale reception on May 11th from 4:30-7:30 at CVAC. WHAT IS A WHISKEY PAINTING? A WHISKEY PAINTING is a miniature watercolor (4”x 5” max. image) painted by a bona-fide member of the WHISKEY PAINTERS OF AMERICA (WPA). The WPA was started in the late 50’s and chartered in 1962 with the club electing a President and forming a Constitution and By- Laws, with rules for Membership requirements. It started in Akron, Ohio with a small group of professional artists belonging to the Akron Society of Artists, and one individual in particular; Joe Ferriot, artist and owner of a local Plastics Mfg. firm, who was instrumental in the formation of the Whiskey Painters of America. Joe, traveling extensively for his firm (and longing to paint on these trips) devised a small palette out of an aspirin box, divided with plastic strips to hold his paint and devised a screw-together brush [like a pool cue] that would fit inside this small box along with strips of watercolor paper cut to about 4″ X 5″ so that all would fit neatly into his shirt pocket. After business hours were completed, Joe would retire to the nearest “Watering Hole” for relaxation and friendly imbibing. He would then remove his small painting kit, and to the delight of the bartenders and patrons, produce one of his miniature masterpieces by dipping his brush into his glass of booze, which then he would give away. Needless to say, he was an instant celebrity, making many new friends and rarely having to buy a drink! His mini paintings, which he dubbed “Whiskey Paintings”, became a sought-after commodity! Back among his cohorts from the Akron Society of Artists, he encouraged each to do likewise when they got together for a lavation after their regular meetings. After they finished their paintings, they would put them all into a hat and then retrieve one thus, having a great time and going home with a fellow artist’s painting. To encourage this, Joe had his factory design and produce mini palettes which he then distributed to his friends. Many of the artists still have those original palettes and use them today! One foggy night in 1962 at the Tangier Night Club in Akron, Ohio, approximately 14 members met, formed a charter with by-laws, governing rules, elected a president [Joe Ferriot], trustees, and named it “The Whiskey Painters of America”. Joe served as the President for about 10 years until his business requirements forced him to step down, turning the duties over to A.H. Don Settle, who served for the next eight years. Settle then relinquished the duties to Louie Mong, who then served as President for the following eight years. Citing health problems, he turned the job over to L.J. [Tony] Cross, who served as the fourth President for the next fourteen years. Tony decided to step down in Aug. 2003 and asked Jack Mulhollen to take over as the fifth President. After Jack Mulhollen stepped down as president, he passed the torch on to Ron Beahn, who remains in that position to this day.